Do I even have to explain why I chose this photo? “Do you honestly believe that I don’t have a Plan B?" 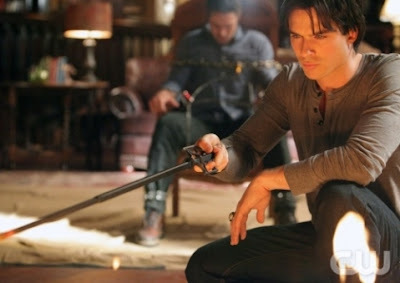 The inevitable: Damon has finally killed the werewolf but in a not-so-vampire-way. He had help from Jeremy, who's finally having a role in the series after Anna(†), and witch Bonnie who hates helping vampires. I expected a leveled arena with some awesome fight scene instead of a torture scene. But even with Mason dead, Katherine still has plans as many as the alphabet letters. It turns out she's also got Jenna and Matt doing her bidding. Nobody's dead yet, but you've got to wonder who will be soon. The writers handle predictability well enough for viewers not to be able to predict what's next. Even now in its second season, they haven't ran out of twists and turns that can really shock. That (and Damon, of course) is the reason why I watch this show. Plus, scenes with heart a.k.a. Caroline compelling Mama Sheriff to forget the only positive conversation they ever had—props to Caroline for displaying undead vampire strength but still managing to let her former cheerleader live on. And humane scenes a.k.a. Stefan patting Damon's back and saying, "Why would you involve Jeremy? "— that is so much like a human-brotherly thing to do. And Elena breaks it off with Stefan in a totally different fashion or reason from other brooding vampire-clumsy female relations.